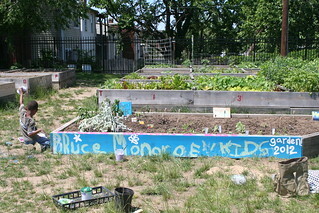 Welcome to the Bruce Monroe Community Garden! 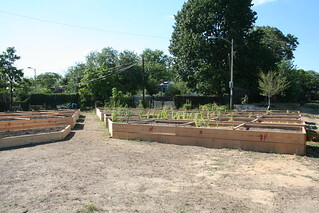 We began our all-volunteer garden in the summer of 2011 when we built 130 raised beds throughout the spring and early summer. Over the next three years, we expanded the garden to 194 rented plots and 20 shared garden spaces for communal gardening and kids gardening activities. Please contact us if you’re interested in getting involved in our garden! 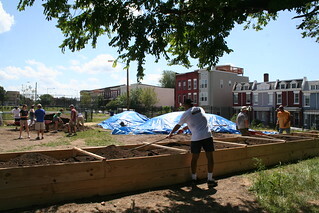 Volunteers build and fill the new raised beds in 2011. 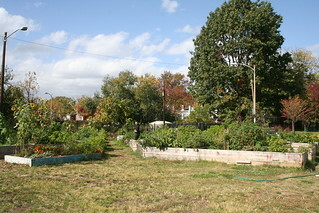 The garden in 2011, with newly built raised beds, fresh compost soil, and just a few seedlings growing. By 2012, things really started to fill in. One of the kids’ plots gets decorated during our annual Kids Garden kick-off event..